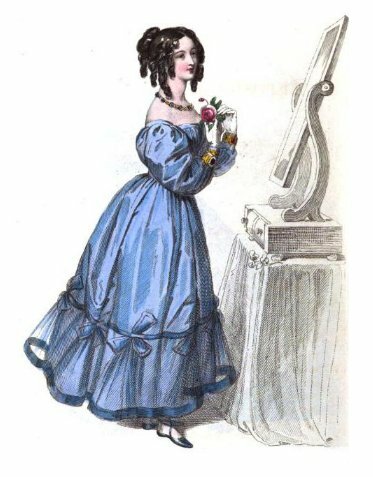 today we’re gonna take a look at the fashion styles of 1829. I really love the big hats decorated with feathers and ribbons and the bright hues of some of these outfits. And, if you’ve ever wondered what costumes fashionable women wore at masquerade balls, here’s a fashion plate with a nice suggestion. Enjoy! Gros de Naples pelisse of Byron brown, wadded and lined with white sarsnet, and fastened in front. The body is made extremely full, with long shoulder-straps, and nearly two inches in width; they are corded on each side. The collar is stiffened, and falls back, admitting an embroidered cambric ruff. The sleeves are large to the gauntlet cuffs, which are very broad, and button close to the wrists; they are corded, and the upper part pointed. 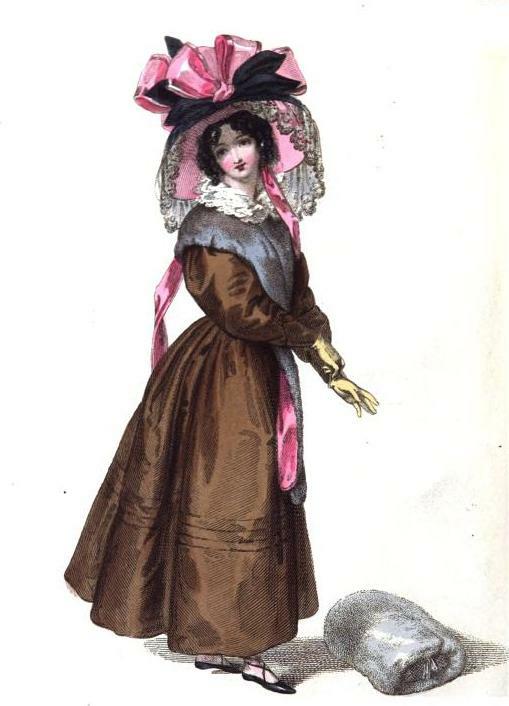 The skirt is very full, and terminated with a plain deep biais trimming of the same material as the pelisse, and turned under so as not to give any indication of a hem: it is headed by three rouleaux. Hat of Byron brown terry velvet, lined with rose-colour satin, and a deep curtain veil of black blond. The crown is rounded at the top, and ornamented in front with large spreading bows of rose-colour satin riband, edged with black, and several large velvet leaves. The strings are long, and of rose-colour satin. Squirrel muff and long tippet; primrose-colour gloves, and black shoes. Dress of white satin, the bodice made rather low, and the front formed into longitudinal drapery, and confined in the centre by a gold-colour satin corded band; the remainder of the bodice is quite plain, and close to the shape. The sleeves are short and full, and set in a gold-colour satin corded” hand; the extreme fulness is regulated by a band passing through the centre round the arm. A circular cape emanates from the front of the shoulder, and is ornamented with a wreath of leaves formed of gold-colour gauze riband. The skirt is plaited in full round the waist, and has a border of white tulle of double-reversed plaitings, nearly half a yard deep, headed by a wreath of gold riband leaves, similar to those on the cape. Sash to correspond. Toque of cherry-colour blond tulle; the frame open, and of gold-colour satin, pointed all round the head, with bands crossing the crown, and admitting the hair, which is dressed in hows, between, and in large curls in front. The blond tulle is in several plaits on one side of the centre point, and plain on the other; it spreads very wide, and is supported by broad gold riband loops, commencing with gold acorns, and is terminated on the left side by two bows and an end; on the right, the gold loop extends over the tulle to the crown, and is inserted by a gold acorn, with which every point is ornamented: long strings of gold gauze riband. Necklace, an entwined chain of gold and ornamented locket. Long gold ear-rings terminating in the form of a coronet. White kid gloves; cherry-colour satin shoes and sandals. 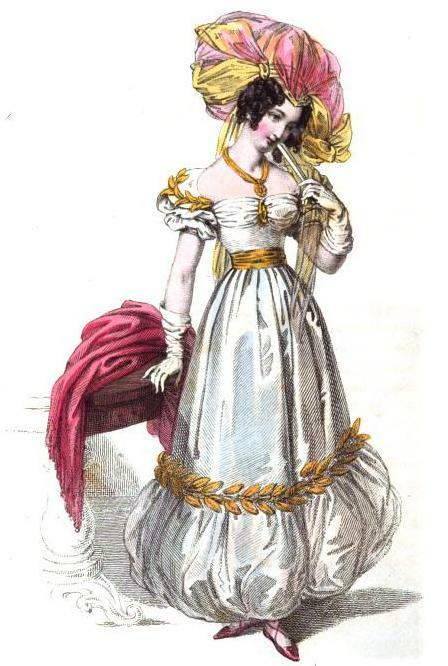 Dress of ethereal gros de Naples, the corsage a Venfant, set in a satin band of the same colour; the sleeves are long and full, with a stiffened gauntlet cuff of ethereal satin: the skirt, made extremely wide and slightly plaited in at the front and sides and very full behind, is trimmed with a deep garniture of tulle, having at the lower edge a broad stiffened band of ethereal satin, and headed by a corded biais band of the same, ornamented at regular distances by triplets of the Carniola Saxifragia corded. The hair is in the picturesque style of Charles the Second, the forehead being displayed and ringlets arranged on each side; the hind, hair is tied at the back, and a cluster of ringlets fall gracefully behind. Necklace of turquoise, set in a delicate wreath of dead and burnished gold; earrings en suite; broad gold bracelets with medallion clasps placed at the upper edge of the cuff, and smaller fancy ones nearer the hand. White kid gloves, stamped and tied at the wrist; shoes and sandals of ethereal satin. 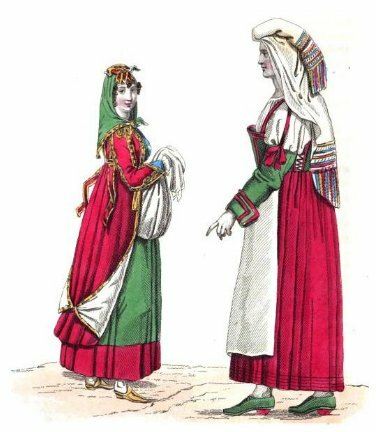 COSTUME OF THE ISLE OF PROCIDA, NAPLES: Dress of twilled sarsnet of a bright emerald colour, made high and plain, with a stomacher of gold lace, the skirt terminated by a broad border of scarlet cloth; the pelisse or surtout en militaire of scarlet cloth, lined with white satin and edged with gold lace, the skirt is open in front and reaches only to the border of the under dress; it is turned back, and the corners fastened together behind by a gold clasp. 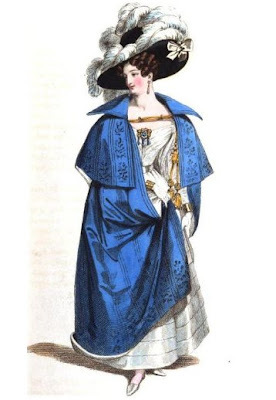 The body and sleeves are made close to the shape and ornamented at the seams with gold lace; bands of scarlet edged with gold hang loose from the waist, which is encircled by a gold belt with a splendid clasp in front; epaulettes to correspond: triangular cuffs of Tyrian blue velvet edged with gold; ruffles of the finest lace. The hair is confined, except a few curls on the temples, by a scarlet and gold checquered silk fazzoletto, tied in front near the top of the head and concealing the corner of a green silk barege fazzoletto, which is edged with gold lace: the opposite corner reaches nearly as low as the waist and is ornamented with a gold tassel; the other corners tie in a knot with long ends under the chin; lace apron, white silk stockings, gold colour satin shoes, pointed on the instep, lilac kid gloves. COSTUME OF OSTIA, ROME: Camisole of fine lawn made very full, and arranged in perpendicular plaits ; the sleeves wide and set in wristbands ; stiffened bodice of green cashmere, bordered and trimmed with geranium colour riband, open at the side, and laced with green cord, displaying the camisole beneath. The shoulder-straps are very long bands of geranium colour, and from the centre of each descends a similar band reaching to a green cashmere; close upper sleeve, which extends half way between the shoulder and the elbow, and is decorated by a bow of geranium colour riband; the cuff is turned back, and has square corners, ornamented by two rows Of riband; geranium colour petticoat of Swiss stuff bordered by two rows of narrow black velvet; apron of white lawn. Hair dressed a la Madonna, entirely concealed by the head-dress, which is formed of a delicate transparent white shawl, enlivened by ends embroidered in rows of the brightest colours, and a deep fringe to correspond. Michael Angelo has beautifully introduced this headdress frequently in his paintings; the half of the shawl is rolled up and placed on the top of the head, the other half spreading wide over the shoulders, and when the fair wearer chooses, closes in front, and conceals the face; grey stockings, green shoes, with scarlet heels. White tulle dress, over a white satin slip; the body en draperie, regulated in the centre by a perpendicular white satin rouleau; the drapery rises in a point from the waist, and spreads very full, in small regular folds, across the bust as far as the shoulders, which are a good deal displayed; the sleeves being placed low, they are very large to the wrist, where they are terminated by broad gold Egyptian bracelets, confining the white kid gloves. In the centre of the bust is an elegant Egyptian brooch, with pendant drops, corresponding in delicate workmanship with the ear-rings, which are also of gold; the skirt has tucks to within a quarter of a yard of the waist, they are placed close to each other, and are about a finger’s length in depth; the fulness of the skirt is principally at the back, but it is slightly continued at the front and sides. White satin sash. Large black velvet hat, with a white satin bow, just within the brim on the left side; a plume of white ostrich feathers placed behind, are arranged with the greatest taste; one extends to the front, where it is attached to the crown, and turned for the end to play freely; a second is fastened to the top of the crown, twisted, and falls over to the front; two more, twisted half way, fall gracefully towards the right shoulder. Cloak of striped lilac satin, with an elegant border, formed by a perpendicular embroidered sprig being placed between each stripe; the cloak is wadded, and lined with white satin, and fastened by a gold-colour silk cord and tassels; it has a large square collar, and a larger square cape, reaching below the elbow. White satin shoes.